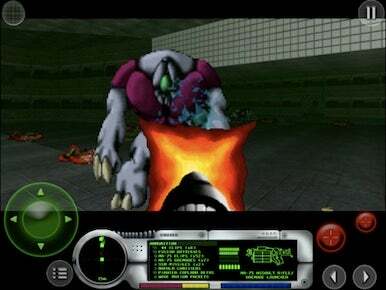 Talk about a blast from the past: Marathon, a first-person shooter game that took the Mac OS by storm in 1994, is making its 21st century comeback—this time on the iPad. Developed by Soli Deo Gloria Productions, Marathon 1 is available as a free download from the App Store. At the time of its Mac debut 17 years ago, Marathon was a moody and ground-breaking game that both added new dimensions to the "shoot everything that moves" genre, and scared the tar out of gamers playing on a PowerBook Duo 210 in a darkened room. (I speak from personal experience.) Modern players jaded by Left 4 Dead and zombie Nazis on their iOS devices may feel otherwise, but get past the older graphics and you may be intrigued by the storyline in which you battle alien slavers aboard a starship. Soli Deo Gloria Productions is actually a one-man operation—a Marathon fan and indie game developer by night named Daniel Blezek who, with Bungie’s blessing, used the Marathon source code released in 1999 to build an iPad port. As part of its 20th anniversary celebrations, Bungie last month released the source code for the rest of the Marathon series, meaning the entire trilogy could one day be on an iPad near you.